GALION —There is still a great need for flood relief buckets. Galion St. Paul United Methodist Church is spear-heading the local part of a nationwide effort to provide buckets of cleaning supplies to residents of the Houston area and other parts of the country suffering from recent catastrophic flooding. The United Methodist Church Committee on Relief, a ministry of the United Methodist Church, organized athe campaign to get cleaning kits to victims of Hurricane Harvey. St Paul UMC is part of the effort. Locally, the goal is 100 buckets. “The idea behind the buckets is that this process of cleaning up is going to go on for weeks — maybe months — for some people,” Jones said. “There is going to be a need for a long time. You can pick up buckets at Liberty Mill and a list of supplies to go with it. The list of cleaning supplies is pretty specific, and includes items like dish-washing gloves and dish soap, heavy duty trash bags, insect repellent, clothes lines and clothes pins and sponges. The supplies are available at most drug stores and super markets and big box stores. When your bucket is filled, drop it off at St. Paul United Methodist, 746 Cherry St., from 8:30 a.m. to 12:30 p.m. Monday through Friday. 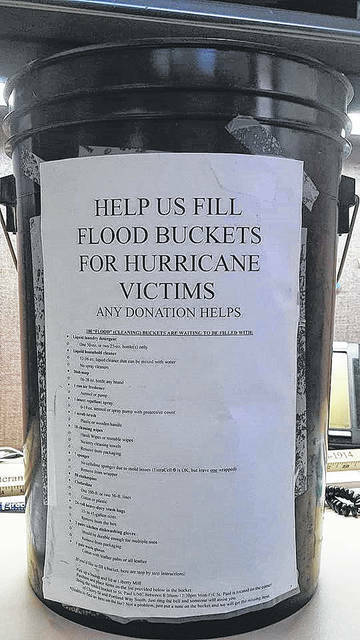 Locally, the buckets will be collected and taken to Pennsylvania. From there they they will go to Houston to assist those still cleaning up from Hurricane Harvey. For many victims, being able to clean their homes and personal belongings is a big step in getting their lives back to a sense of normalcy.